and well educated, teen mental health advocates. 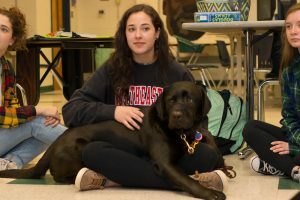 Our program brings together school communities and teens that have been affected or show an interest in brain health and recovery as well as psychiatric service dogs. This natural connection helps to open up the conversation of mental health and get kids talking to their peers about how they are feeling inside and breaking the stigma associated with some of those feelings that are often kept quiet. Research has shown that peer support has numerous benefits from simply feeling a connection with someone to decreased hospitalization. A conversation that is reciprocal allows the peers to open up knowing that they are not alone in their struggles which helps on both sides of the conversation. 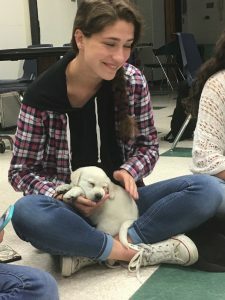 Our teen advocates will provide an empathetic, safe place to talk even if the conversation revolves around the duties of a psychiatric service dog. Working together with Mental Health America and Teen Talk, we have come up with a wonderful program that brings together a group of kids that have a desire to talk openly about all of our inside struggles. 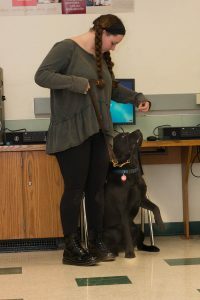 The Exceptional Sidekick Teen Advocate Program is a six week program comprised of Mental Health Peer Advocate Training and Psychiatric Service Dog Training. Lauren Wolfe MS, LPC, will be working directly your school mental health professional to give the students weekly assignments that cover the major mental illnesses that the students are most likely to encounter in their community. Anxiety, depression, bipolar disorder, psychosis, eating disorders, and recovery are some of the topics that will be touched upon. Through each conversation, it is our goal to teach the teens that all of these illnesses or disabilities feel differently to everyone. We want them to learn that each person’s struggle is that person’s own. Teens will be taught how to use effective listening skills to support their peers as well as learn when and how to help a peer access professional help if needed. Our program will also teach the teens healthy self-care practices that can help them manage everyday stress. Sometimes it’s tough to talk about mental health, but the conversation is too important not to have and the kids in our program are equipped with tools to lend a compassionate, trustworthy ear and even further the conversation with their own experiences.